The theme for Sawyer’s party took me forever to decide. So long that by the time I made up my mind it didn’t leave much time for the planning. 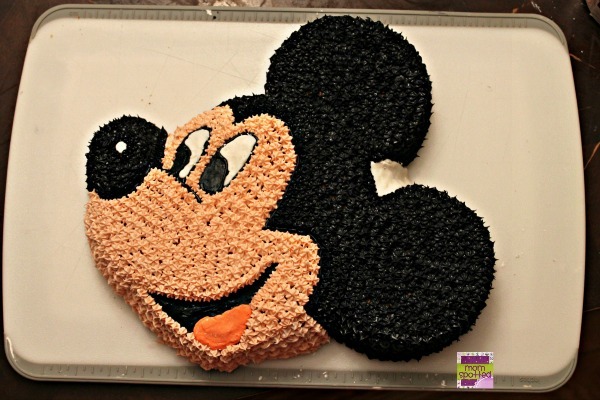 I wanted to be creative on the cake and almost even did a review on a really cute one from a local baker but in the end, I really wanted to make his Mickey Mouse Birthday Cake myself. So the morning before the party I woke up in a panic. I still had no idea what I was doing for the cake. The worst part was I had no idea what I was going to do if I made it and I was almost out of time to order one. Hubby & Johnny were at a soccer game so Gavin, Sawyer & I ran to Michael’s. We knew everything we needed we’d be able to get there. I didn’t know if I wanted to layer cake rounds or do a character pan. 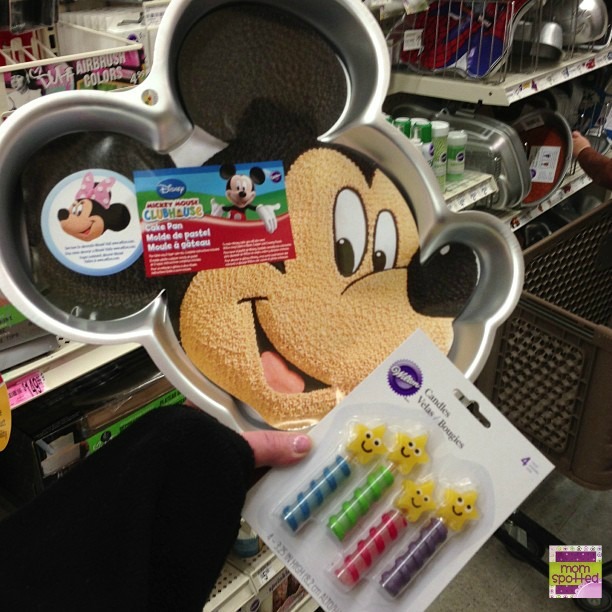 Well, the Mickey Mouse Birthday Cake Pan from Wilton was my final decision. I had done one other character pan before so I had some experience. I was worried about my timeline since I really didn’t start baking the cake until late. I think it was around 8 pm. It took one box of cake mix. When it was done baking I let it sit for ten minutes and then placed it in the fridge for an hour. It was late and I needed to make sure it was completely cool so I could frost it before going to bed. Before I flipped the cake out of the pan I needed to make the bottom level. You can see in the above picture that the cake rose higher in different areas. I use a long bread knife so it rests on the top of the pan on both sides so I know I stay flat. While your cake is cooling prep your frostings. Make what you need and dye it. Remember that colors darken in time. Some only need a little dye. The copper coloring needs VERY little color to achieve the proper color. The black will need a LOT. It will be dark gray in the beginning but will darken over time. Make sure your area has everything you need within arms reach. When I flipped the cake over I got really nervous. All the lines that were in the pan didn’t transfer over when it was baked. I knew the initial design relied on my lines. I didn’t have them but another Wilton Mama, Cat @ Food Family Finds said to use food writers! What a clever idea! I just wish I had some on hand. Here was how I ended up doing the decorating. My frosting kept getting soft REALLY fast and it was going in and out of the fridge so you see me going back and forth with the colors. I did pretty well on the lines. Don’t be afraid to wipe off and start over. You’ll notice I even wiped off the nose too at one point. My stars were just so sloppy from the warmer frosting and I wanted it all redone. 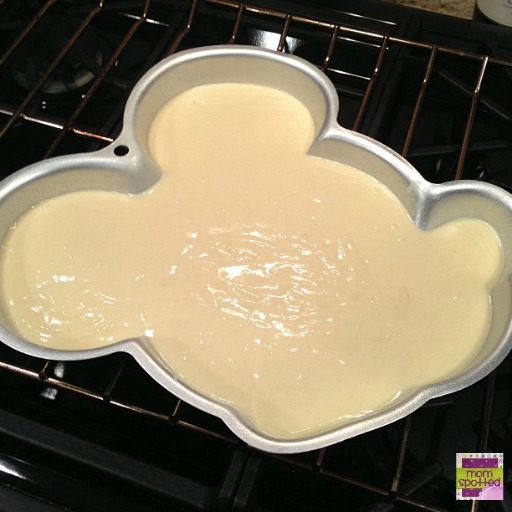 The nicely flatten areas have a small cup of cornstarch handy to tap your finger in before tapping the frosting. 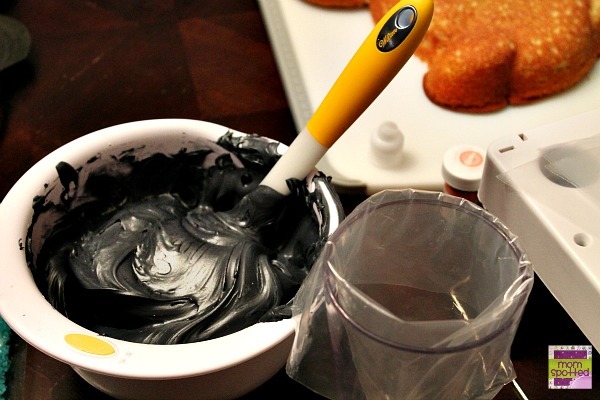 If you don’t coat the frosting the little but on the frosting will fade away. I didn’t finish until around 3 am but I was very pleased with it in the end with my Mickey Mouse Birthday Cake. Up until the end, I always doubt myself but I really need to be more confident. My stars could be tighter and have fewer spikes but no one is judging it. (I hope). At the party, it was a huge hit and fit in perfect with all out decor. I ended up not using the original candles and used this great Mickey Mouse 1st Birthday candle from Party City. 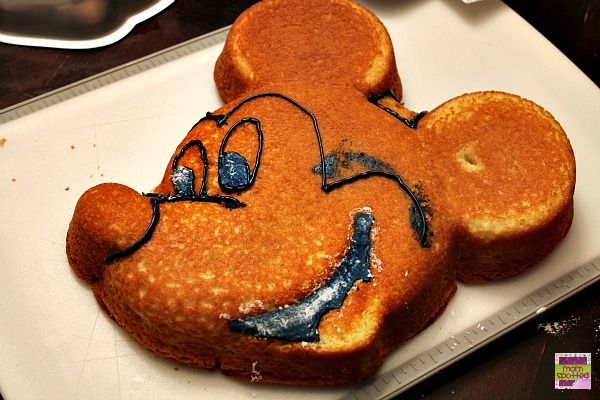 I was glad I chose to make his Mickey Mouse Birthday Cake myself. It was the perfect finishing touch to his party! 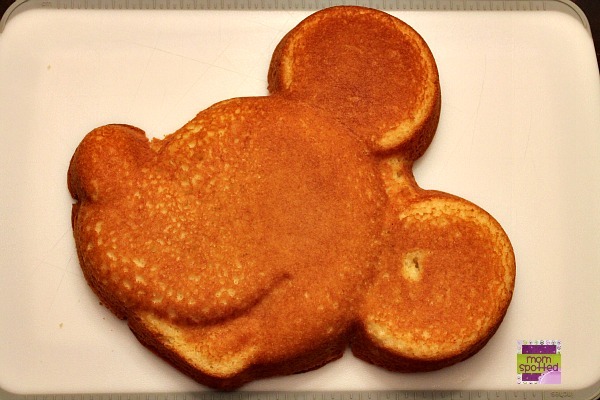 If you think you can’t make one of these cakes- you can!!! It really comes down to patience. These cakes take hours to decorate when you don’t do them often. The finishing result just makes it all worth it. 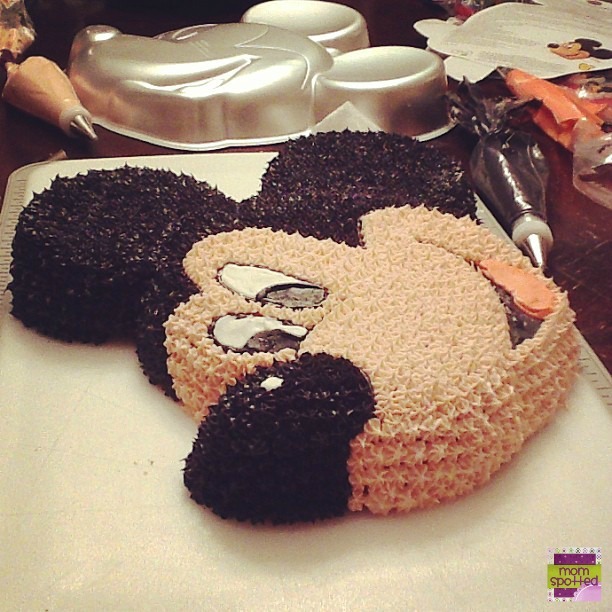 Have you ever made a character cake? Woman you have sooooooo much more patience then I do LOL It turned out wonderful! This came out great, I’m impressed! Are you for hire? I’m dreading making a cake – you did fabulous! wow that came out awesome!! a lot better than what I would do if i made a cake. I usually just do a round pan and slap some frosting on it and call it a day! 🙂 My mom used to bake and decorate cakes like that all the time for people as a side business. That’s flippin’ amazing! I had big ideas about my son’s hungry caterpillar first birthday cake, but I ended up doing one red cupcake (his smash cake, the caterpillar’s head) and a bunch of green (the body, for the kid guests) cupcakes. I love this cake! 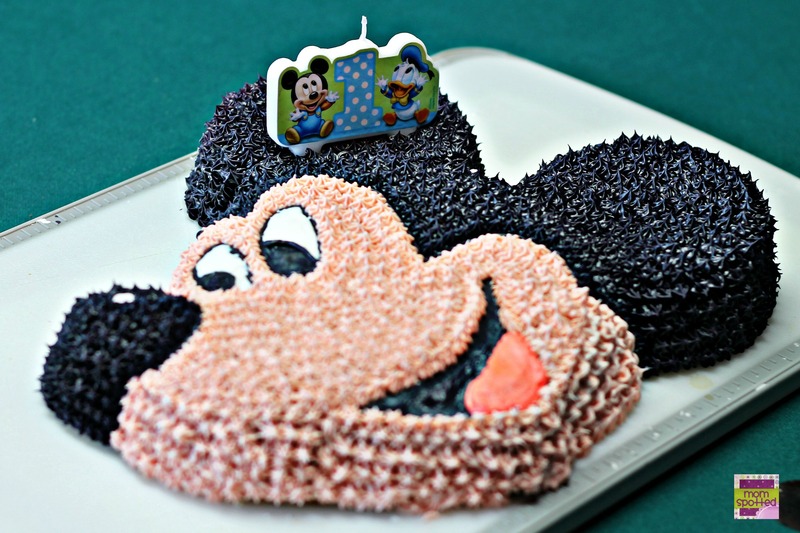 I am throwing my son a Mickey Mouse Clubhouse 1st birthday party in June! This would be perfect! I know exactly what you mean! I always underestimate just how long it takes to star tip a cake, especially when you are trying to make a face or body. And I’ve had issues with frosting temp too, especially in the summer. You did great! Your finished product looks amazing! I have that problem too with the frosting where it doesn’t stay cold and then it will get runny and turn into a mess! Awww that cake turned out so cute! wow perfection! you should work in a bakery! This brings back memories! My mom always made us character cakes when we were young! Now that I have one of my own, I am more of a cupcake person! But this looks beautiful! Great work. That is amazing! I remember my mom making and decorating a Strawberry Shortcake one for my sister when we were kids. You did a great job getting a good black for Mickey! Wowza! I have to say that I’m very impressed! I really am! You have inspired me. I always wonder though if your rms get tired or cramped from doing all those stars? Wow! You are so talented! Makes me believe I can do it too! That’s so cute! One year I make a candy train using the same method. It seemed to be a hit. Holy cow that turned out amazing!! I could never have mine look that nice. Sawyer is one lucky little guy ti have a mom that bakes like you do! 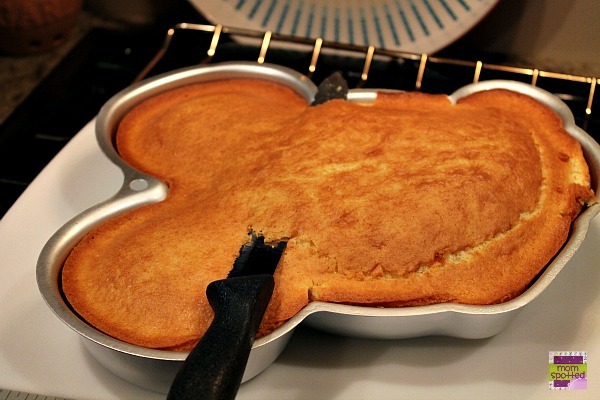 I have this cake pan somewhere and have had it for years. You did such a good job I think I will try to make it myself for my grandchildren. Glad you had fun making it. Children don’t remember all the details of these occasions but they do remember the love! Nice job! The Birthday Boy is too young to appreciate all your effort, but I’m sure the adult party guests were suitably impressed. I know I am! What a cute cake, I’d almost hate to eat it. This would be really intimidating to make, so I appreciate the step-by-step tutorial. It looks fabulous! Hurray for Mickey! This is cool. I want to make my daughter’s bday cake. you have inspired me! what did you use for the skin colored frosting for his face?? I don’t remember but I did it exactly how the pan recommended to do it. My grandson loves mickey mouse and I’ve been looking for one. I appreciate your sharing the step by step instructions since I am not the best baker but I promised him and thanks to you I will deliver! Wow, great looking cake. I love the texture of the frosting, I might have to steal that trick! Wow this is really nice. Thank you for sharing how to decorate this cake. OMG! That is so amazing. 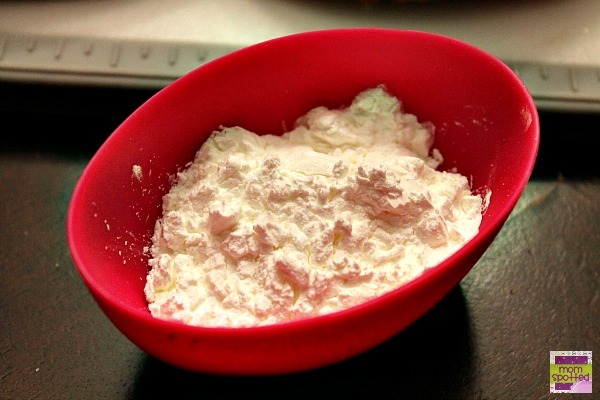 It makes me want to bake right now! ugh, I’m craving cake nowww.